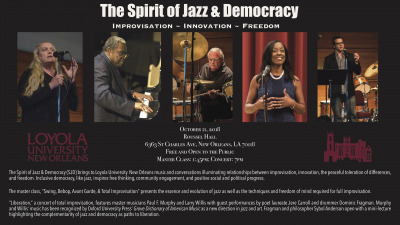 The Spirit of Jazz & Democracy (SJD) brings to Regis University music and conversations illuminating relationships between improvisation, innovation, the peaceful toleration of differences, and freedom. 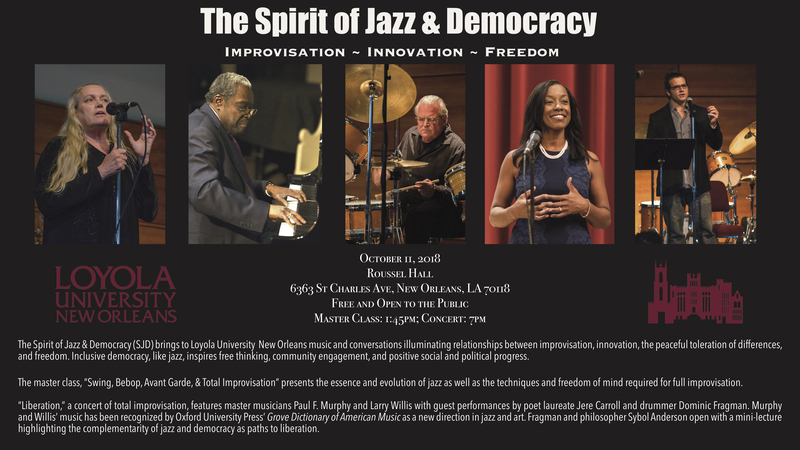 Inclusive democracy, like jazz, inspires free thinking, community engagement, and positive social and political progress. At 7 pm the SJD ensemble performs “Liberation,” a concert of total improvisation. 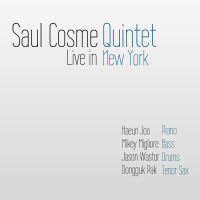 The music has been recognized by Oxford University Press’ Grove Dictionary of American Music as a new direction in jazz and art. The concert will open with a mini-lecture highlighting the complementarity of jazz and democracy and the value of intentional listening.